The Lega, founded in 1991 under the name Lega Nord, is amongst the oldest populist and Eurosceptic parties in Europe. 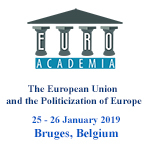 An analysis of the history of the party and the evolution of its political discourse allows a better and more context-embedded understanding of its Euroscepticism, especially since in its early years the party’s programme was rather pro-European. The Lega’s sometimes contradictory stances on Europe are the outcome from conflicting dynamics that guide the party’s politics. Its identity discourse has constantly emphasized the European-ness of northern Italy, since the party professed to associate northern Italy with Europe, its modernity and economic success, as opposed to the Italian state and southern Italy. This European-ness has increasingly been understood in culturalist and exclusionary terms. The party’s economic discourse, for a long time focused on the defense of the interest of small and medium entrepreneurs in northern Italy, has articulated contrasting views on Europe and the European Union. It has understood Europe as a market, and the European Union as a body that should offer protection to northern Italian entrepreneurs from presumed unfair competition. It has in a first stage envisioned the EU as an institution that could protect the north against the Italian state, but increasingly as a bureaucracy that favours the larger states in Europe. The party has in particular been critical of the Euro, interpreted as a currency that favours Germany, while it renders competitive devaluations (previously often employed by Italian authorities and advantaging the export-oriented entrepreneurs of northern Italy) impossible. Euroacademia. Copyright © 2019 .